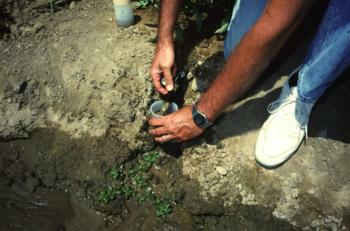 Periodic flushing is required to prevent clogging from sediments, particularly along the lower part of the drip line. A 200-mesh filter will not remove particles of fine sand, silt, and clay or fine particles of algae. They will pass through the filter and be deposited in the drip lines. To flush the lines, open the ends of the laterals and allow the water that discharges from each lateral to carry the deposited material with it. The key to adequate flushing is to provide an open-line flushing velocity of at least 1 foot per second at the end of the drip line. For a 5/8-inch-diameter lateral, a flow rate of 1 gallon per minute at the end of the lateral is required to achieve that velocity. A flow rate of 2 gallons per minute is needed for a 7/8-inch-diameter drip line. You may have to determine by trial-and-error the number of laterals that you can be flush at the same time and still maintain the desired flushing flow rate. Flushing practices for row crop drip systems often are different from those for permanent crop drip systems are often different due to differences in drip system design. For additional flushing information, see Row Crops or Tree and Vine Crops.